I swam the English Channel | John B Ward Co.
Every year, I represent John B. Ward & Co. to all my clients. 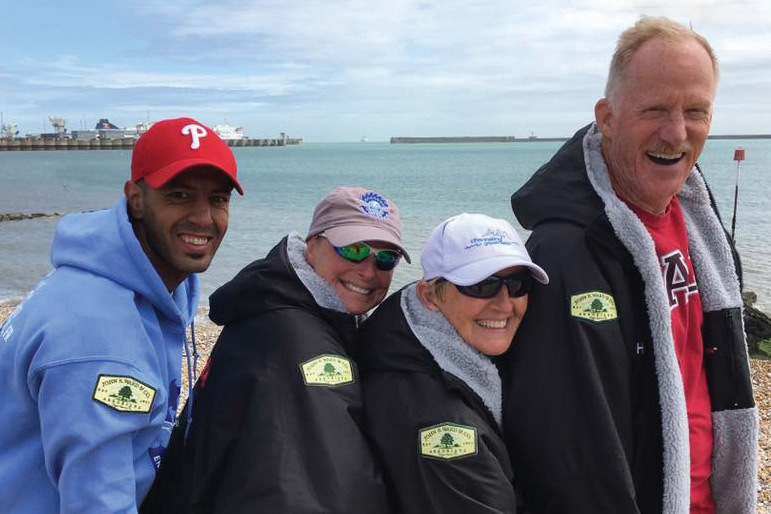 In 2017, I had the privilege of rep-resenting the company, and the United States, in another way: as a member of Channeling Greatness, a six-person relay team that completed a swim across the English Channel. During our eight-day “wait period” – as we waited for the weather and for the other swimmers who were scheduled before us – the waters were too rough for swimming, with the exception of one day. An 18-hour calm between the storms gave us our best chance for success, even though we were the third swim scheduled. The first of nine boats carrying teams went out at 3:00 a.m. Our team was in the last boat to start, at 5:00 a.m. Of the nine boats, only six finished. When our boat arrived south of Dover, England, my wife, Louise, started the swim. She jumped out of the boat and swam to shore, walked out of the water, and raised her arms until the boat horn sounded. Then she turned around, walked back into the water, and started swimming toward the coast of France. The rest of the team members followed. Fourteen hours and 40 minutes later I arrived in France, walked out of the water, and raised my arms. When the boat horn sounded this time, I swam back to the boat and we all headed back to England. Within an hour, the stormy seas had returned. But Channeling Greatness had met the challenge!